Happy Mardi Gras! To celebrate, you could attend one of the local Mardi Gras celebrations, like Fat Tuesday at the Mansion, or you could visit All Saints’ Episcopal Church tonight for their annual Mardi Gras feast. If neither of these is your style, you could try reading something set in the city that’s known for Mardi Gras: New Orleans! Sabina Kane is a mixed-blood, half-vampire and half-mage. She’s also an assassin, and her temper and smart mouth frequently land her in a heap of trouble. This time, her evil vampire grandmother, Lavinia, had kidnapped her newly-discovered twin sister, Maisie, and Sabina is determined to rescue her sister—and eliminate Lavinia for good. Along with steamy mage Adam Lazarus, and her demon familiar, Giguhl, Sabina heads of to New Orleans in search of Maisie. An uneasy alliance with the Fey Queen and weakened mages supports Sabina’s efforts, but they’re more concerned with killing Lavinia than rescuing Maisie. With the help of a voodoo priestess, a drag-queen changeling, and the lead singer of a rock band, Sabina races to find her sister before Lavinia can murder her, and in the process summon an ancient evil. Jaye Wells is an author with local ties, since she lives in Texas, and has been known to frequent the Dallas/Fort Worth area doing book signings and even appearing at ConDFW. Her Sabina Kane urban fantasy series blends vampires, demons, and fey with arcane magic, snarky humor, and tons of action. 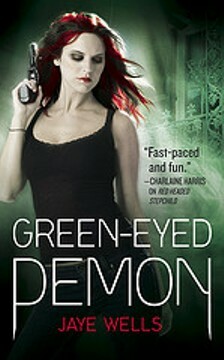 The latest book in the series, Green-Eyed Demon, is no exception.